... even if you are suffering from Too Many Social Networks Disorder (TMSND). I seem to get an invite to join another social network site every few days. Between Facebook, LinkedIn and Twitter, I can barely keep up. However, if you are a credit union marketer, there are two more communities that you should consider joining. 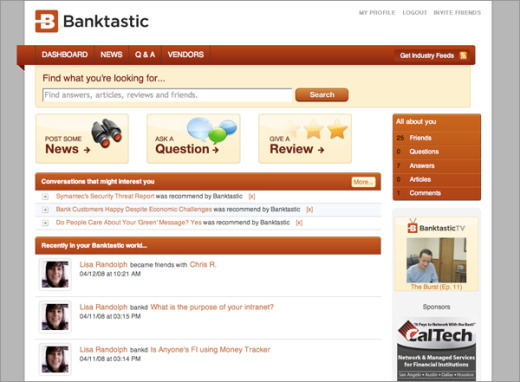 Banktastic is the brainchild of The Garland Group, a Texas-based IT and security risk-assessment firm. A close-knit growing community of progressive members who care about Web 2.0, financial services and all things bank and credit union. Bantastic is open to everyone. The Garland Group CEO, Brad Garland, and software developer, Mark McSpadden are very active participants throughout the credit union blog-o-sphere. Community manager, Lisa Randolph, is very active on the site and is a huge contributor to the content. She also produces much of the Banktastic videos. Having a dedicated manager is brilliant and really ensures that the site will be active in the future. There is lots of great video content cranked out weekly. There are two shows, The Burst and The CU Scoop. Both shows can be found on The Banktastics blog. Although it is not credit union specific, there are a number of credit union folks participating and Banktastic will give you exposure to the broader banking world. It just came out of semi-private beta on April 1, so there aren't that many members yet, but this will change over time. The word 'Bank' is in the name. Sorry Brad, I had to give you a bit of a dig on that one. You know me and my credit union singularity! EverythingCU is an active community of credit union marketers dedicated to discussing marketing and branding issues facing credit unions of all sizes. It is well-established with over 5,900 members. Open only to credit union employees, so you can discuss things openly with your peers without feeling like vendors (like me) are spying on your world. Chief Innovation Officer, Morriss Partee, is a card-carrying credit union cheerleader and he and his team have done an amazing job at creating a wonderful resource for the credit union world. Everything CU offers great webinars and the discussion board is very active. Since I am unable to sign-up, I can't tell you much more about Everything CU, other than I have heard it is very worthwhile. For you, nothing. For me, I am stuck outside looking at the home page. Hey, if I am going to give Brad a hard time, I should also give Morriss a dig to keep things fair. Even though your TMSND might be at an all-time high, check out Banktastic and EverythingCU today and sign-up. Both communities are free, offer valuable information and will do you a lot more good than adding another useless drinking game app to your Facebook profile (did I just say that? ).